The construction industry is fast-paced and ever-changing. Change can be exciting for workers and their supervisors, but it can also be challenging. Not taking the time to ask the right questions about safety when a job changes can potentially lead to unsafe choices, accidents and delays. 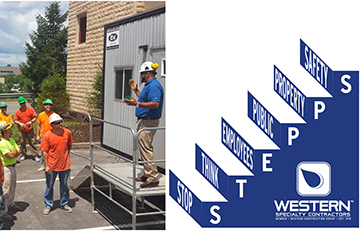 Starting in May, Western Specialty Contractors launched its S-T-E-P-P-S (Stop, Think, Employees, Public, Property, Safety) Program designed to get workers to ask the right questions about safety during job changes and develop the answers that will prevent accidents. “Since their jobs change every day, Western is requiring that every worker and their foremen STOP and assess their jobsite and tasks for the day as part of their Daily Huddle, then THINK about the process for the day,” said Western Safety Director Eric Olson. EMPLOYEES – How can our employees get hurt today? By evaluating the job and asking about the potential hazards, foremen can address any issues immediately and ensure that their crews have the right people, equipment and processes in place to prevent injuries. As the job changes, these answers become even more important. Every type of injury should be considered, even soft tissue ones. PUBLIC – How can the public and those around us potentially get hurt today? It’s important to note how job changes may impact the public, and to take steps to ensure that those living and working around the workers are not hurt. PROPERTY – How can workers potentially damage nearby buildings, cars or other forms of property during their activities? As crew members work at heights or with harsh chemicals, they should be considering the proper precautions to ensure that they are not dropping items or spraying chemicals onto nearby property. SAFETY – Asking these three questions every day should lead to the right answers. It is the foreman’s job to act on these answers and ensure that Western’s safety initiatives are the top priority. An industry leader in workplace safety, Western has evolved its safety programs over its 103-year history from the basic compliance initiatives to advanced programs that address ergonomic and soft tissue injuries. Western has also initiated a climate for safety that empowers employees to proactively take steps to evaluate their own job site activities and correct procedures to prevent accidents. Western currently boasts an industry-leading, OSHA Total Recordable Rate of 1.58, over two full points better than the industry average of 3.8. The OSHA Total Recordable Rate is based on injury and illness rates per 100 workers and is used to evaluate a company’s safety measures. The lower the number, the higher the safety rating.